So the holiday season is over, it's snowing for the 20th time this month, and the road to spring looks long and arduous. You want to be some place warm. Like Tahiti, or Oahu. But there's that cost thing. If only there were a place in New York where you could go and pretend to be in a tropical paradise. Some place with Mai Tai's and an occasionally overactive radiator, for example. So read the beginning of the invitation for my Brooklyn tiki party. The end of January seemed like the perfect time to throw one, in conjunction with Foodbuzz's 24x24 event, wherein 24 bloggers around the world host food-themed events of their choosing on the same night. 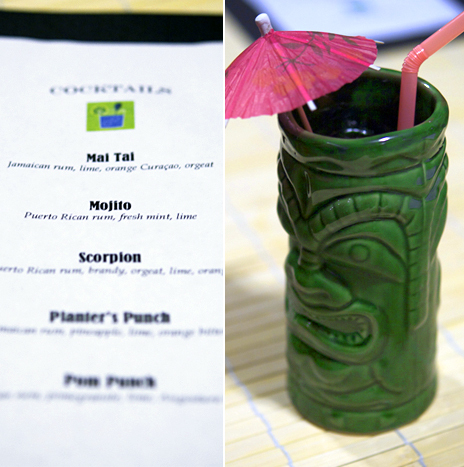 Tiki seemed like a natural choice; Chinese food plays a pretty big role in tiki culture as we know it in the US, and donning a lei and drinking tropical punches seemed like the perfect way to spend a winter's evening. We no longer have a Trader Vic's in New York, but the city has seen some high-profile Polynesian-themed establishments open in the past year, including Lani Kai, The Hurricane Club, and Painkiller. Years ago, before the tiki revival trend, for a fun night out I used to go to Otto's Shrunken Head on East 14th, where you can get highly potent concoctions and listen to The Ventures cover bands. My current apartment, with its open kitchen layout, seemed like the perfect spot to recreate a tiki bar. When tiki bar legends Victor Bergeron (founder of trader Vic's) and Don the Beachcomber created their legendary establishments in California in the 1930's, and grew their franchises in the 1940's, they sparked off a tiki trend that would last for 3 decades. 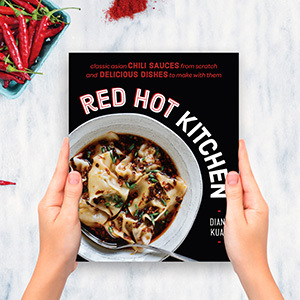 In creating their menus, they drew a lot of culinary influence from Asia and the South Pacific, or at least their own versions of Asia and the South Pacific. Their appetizer menus, in particular, took a lot of cues from Chinese restaurants. In one or two decades, pupu platters (drawing from a Hawaiian concept for appetizer buffets) became tiki standards, serving foods such as Cantonese roast pork, barbecue spare ribs, chicken wings, fried wontons, dumplings, and egg rolls. If you've ever wondered where pupu platters at your local Chinese take-out came from, here's your answer. My menu for the tiki party was a range of finger foods that would go well with the tropical drinks on hand. For the buffet table, I made a big bowl of cold sesame noodles and a bowl of Sichuan cucumber salad. Hot foods, including pork and spinach dumplings and garlic-lemon shrimp shewers, came out of the kitchen with regular frequency. 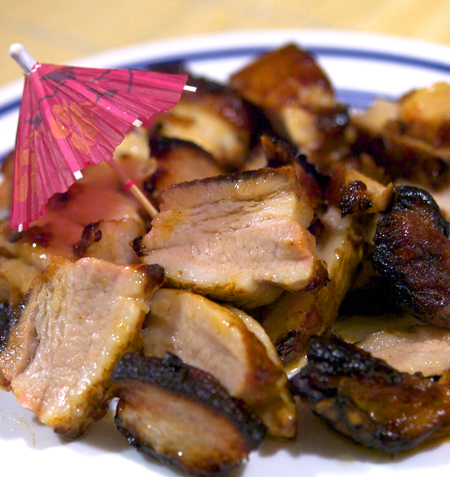 I also made my signature char siu (glazed with a fool-proof sauce of honey, soy sauce, five spice, and sugar), which someone promptly stuck a paper umbrella on. Because chicken wings are so integral to the pupu platter, and because every party needs chicken wings, I decided to alter my sauce for Kung Pao Chicken for these wings. Thus Kung Pao Chicken Wings were born, juicy golden brown wings and drummettes roasted in a marinade of soy sauce, black vinegar, hoisin sauce, chili flakes, and Sichuan pepper, topped with chopped peanuts. (Recipe at the end of the post). Guests: Invite everyone! Or, invite as many people as you can reasonably fit into your apartment without creating a fire hazard. Like most cocktail parties, you don't need to worry about the exact number of chairs, as most people will congregate around the "bar". Even with a short notice invitation, I was able to have 16 guests floating around and having a jolly good time. (Kian from Red Cook helped take some great party shots.) 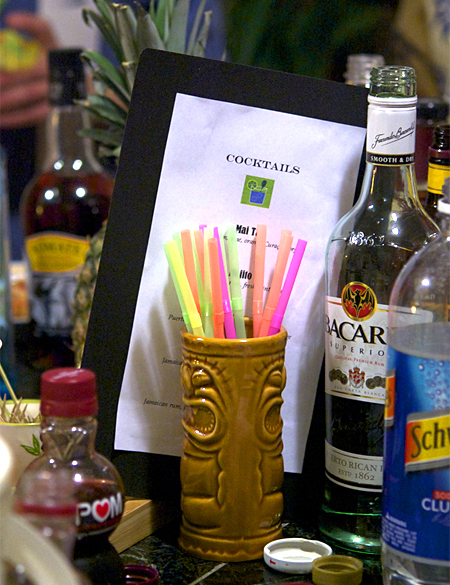 Guests were encouraged to dress in tiki-themed attire, such as Hawaiian or neon green shirts. Plastic lei's came in handy. Decor: It was hard to decorate on a limited budget, but I was able to find some big versions of drink umbrellas at Pearl River Mart, for about $2 to $4 each. Beyond that, bamboo placemats, bright-colored bowls, and a whole fresh pineapple go a long way in transforming your humble apartment into a tiki paradise. Food: Everyone loves pupu platters (even the ones who say they don't). And you don't necessarily need to make fried foods. I didn't want deep-fry anything with a lot of people in my apartment, especially with the bartending being done two inches away, so I served pan-fried dumplings and oven-roasted wings. 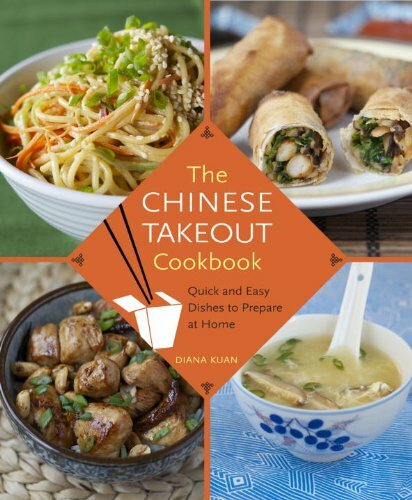 Roast pork and Chinese barbecued spare ribs are also easy to do in your oven. If your kitchen is separate from your mingling area, and you want to deep-fry, by all means include egg rolls and fried wontons. To make a wide range of drinks, it helps to have good rum. I bought dark rum, gold rum, and white rum, along with other tropical cocktailing needs such as brandy, orange Cointreau, bitters, and a range of fruit juices. We made Mai Tai's, Scorpions, mojito's, but the most popular drink of the night, based on an entirely unscientific pole, was the Planter's Punch. The recipe for the party, tweaked during a grueling session of cocktail testing the previous evening, calls a nice dark Jamaican rum base, simple syrup, lime, pineapple juice, and orange bitters. If I did the party all over again, I would have just made a punch bowl of this, since guests asked for it again and again. Another version of the Planter's Punch we did as the Pom Punch, which subsituted pomegrate juice for pineapple juice and Angostura bitters for orange bitters. More herbal, a tad more sophisticated, but no less sugary and potent. I really need to make mid-winter tiki-ing a yearly tradition. Prepare the marinade: In a large bowl, mix together the soy sauce, vinegar, hoisin sauce, sesame oil, sugar, red pepper flakes, and Sichuan pepper. Toss wings with the marinade, cover, and allow the chicken to marinate in the fridge for 1 to 2 hours. Preheat the oven to 350 degrees F. Line a baking sheet with parchment paper or tin foil. Roast the wings for 20 minutes. Turn the oven up to broil, and broil the wings for another 3 minutes to develop a nice golden brown exterior. (If you don't have a broil setting on your oven, crank the heat up to 400 degrees F). Garnish the wings with chopped peanuts and serve. Fill a cocktail shaker with ice. Add all of the ingredients and shake well. Strain into an ice-filled glass and garnish with fresh pineapple or a paper umbrella.